[S25] Hannah McPherson, Holcombe Genealogy, page 151.1. [S116] Esther Griswold French and Robert Lewis French, Griswold, page 175. [S116] Esther Griswold French and Robert Lewis French, Griswold, page 176. [S377] Coralee Griswold Griswold 6 & 7 Vol 1, page 218. [S377] Coralee Griswold Griswold 6 & 7 Vol 1, page 219. [S377] Coralee Griswold Griswold 6 & 7 Vol 1, pages 218, 539. Hiram H. and Mary were enumerated in the 1850 Buffalo, Erie Co., NY, federal census, both were 32 and there were no children in the household. Hirma H. and Abi were enumerated in the 1860 Buffalo, Erie Co., NY, federal census. Children in the household were Ada 5, and Nelly 3. These would have to be Abi's children. There were no children listed in either census that could have been Mary's, but the Griswold Genealogy says she raised 5. Henry A. Christ was born on 20 January 1933 at New Britain, Hartford Co., CT.1 He was the son of Henry A. Christ and Louise D. Holcombe.1 Henry A. Christ died on 4 June 2010 at Newburyport, MA, at age 77. Henry A. Christ, 77, of Newburyport, died peacefully at Anna Jaques Hospital in Newburyport on Friday, June 4, 2010 following a short illness. He was surrounded by his loving family and friends. Henry was a beloved husband, father, grandfather, friend, and innovative educator. He is survived by his wife of 25 years, Susan (Thomas) Christ. Henry was born in New Britain, Conn., Jan. 20, 1933, the son of the late Henry Christ and the late Louise Christ-Osterby. He was predeceased by his sister, Shirley (Christ) Fort. Mr. Christ was a 1951 graduate of Deep River (Conn.) High School. Following graduation, he enlisted in the U.S. Navy and served as a parachute rigger during the Korean War. After the Navy, Henry earned a bachelor’s degree I elementary education from Central Connecticut College and in 1957 became an elementary teacher in Chester, Conn. He earned a Master’s of Education form the University of Hartford. In 1963 he was appointed principal at Salisbury Memorial School in Salisbury. Seven years later, Mr. Christ became the first principal of the Rupert A. Nock Middle School in Newburyport, a school that quickly earned the reputation as one of the best in the country. Seeking yet another challenge, he took the job of Assistant Superintendent and Business Manager of the Triton Regional School District in 1975. Upon his retirement from public education in 1988, Mr. Christ worked for the New England League of Middle Schools, an organization of which he was one of the founding fathers in the early 1970s. There he became a well-respected middle school consultant and evaluator of middle schools across the country until his retirement in the late 90s. Henry enjoyed traveling with his wife throughout the U.S. and other countries. He also loved rooting for the Detroit Tigers, his life-long favorite team. He is survived by his children, Leslie Randall and her husband Dennis, Ronald, and Mark, all of Salisbury, Darlene of Amesbury, and Lisa Bollinger and her husband Erich of Dana Point, Calif; his step-son David Streiff of Newburyport; and his first wife, Claire Amirault of Amesbury. He was the grandfather of Jonathan, Jessie, Charles, and Julia. Funeral services will be at 10 a.m., Wednesday, June 9, 2010 at Twomey-LeBlanc, & Conte Funeral Home, 193 High St., Newburyport. Burial will be at the Highland Cemetery, Newburyport. Calling hours will be Tuesday, 5 to 8 p.m. at the funeral home. In lieu of flowers, donations may be made to the Newburyport Education Foundation, P.O. Box 1002, Newburyport, MA 01545. Orson was enumerated in the 1840 Kane Co., IL, federal census. Orson and Fanny "Kendell" were enumerated in the 1850 Virgil, Kane Co., IL, federal census. He was a farmer, age 37, she was 37. Children in the household were Flora 9, Newton 7, Joseph 4, Albert 2, and Otis 8 months. Orson and Fanny "Kendle" were enumerated in the 1860 Virgil, Kane Co., IL, federal census. He was a farmer, age 47, she was 47. Children in the household were Flora H. 19, "Murton" 17, Joseph 14, Albert C. 12, Otis R. 10, Morton H. 8, and Ruth H. 6. Orson and Fanny were enumerated in the 1870 Virgil, Kane Co., IL, federal census. He was a farmer age 57, she was 59. Children in the household were Otis Read 20, Morton H. 18, and Ruth H. 16, and a John Dooley 14, relationship unknown. Albert and Sarah were enumerated in the 1860 Marion, Linn Co., IA, federal census. He was a master wagon maker, age 45, she was 39. Children in the household were William 13, and Wellington 9. Byron and Caroline were enumerated in the 1850 Blackberry, Kane Co., IL, federal census. He was a farmer, age 33, she was 39. Children in the household were Harriet age 6, Walter age 4, and Estella age 2. Byron and Caroline were enumerated in the 1860 Blackberry, Kane Co., IL, federal census. He was a farmer, age 43, she was 39. Children in the household were Henrietta A. 15, Walter B. 14, Adda J. 7, Floretta 5, and Colt H. 2. Byron and Caroline were enumerated in the 1870 Blackberry, Kane Co., IL, federal census. He was a farmer age 52, she was 49. Children in the household were Harriet A. 25, Walter B. 24, Adella J. 17, Floretta 15, and Colt H. 11. [S377] Coralee Griswold Griswold 6 & 7 Vol 1, pages 219, 541. It is perhaps Jerome and Harriet enumerated in the 1860 Campton, Kane Co., IL, federal census. "J.N." age 37 born in CT and Harriett age 31 born in OH, had a child Fred age 2. 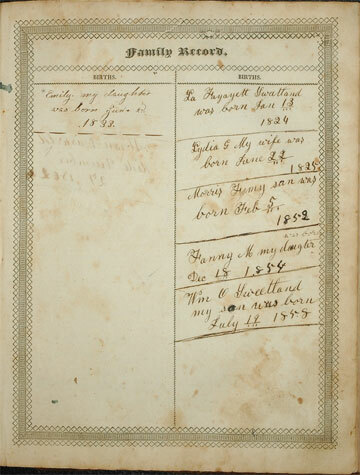 The Griswold Genealogy lists her death as 1 August 1879, the bible says 1874.